Stampede has launched a new promotional program that is giving resellers the chance to sell their way to the 2018 Super Bowl LII, which will be held in Minneapolis on February 4, 2018. 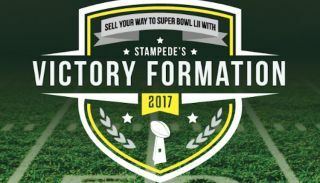 The all-expense paid trip and tickets to the game—for a reseller and their guest—will be the grand prize in the Stampede Victory Formation program that runs through November 30, 2017. To participate in the Victory Formation program, resellers must register here. Once registered, resellers can check their progress by registering for the Stampede Reseler Zone. Victory Formation Points will be awarded for the purchase of qualifying products from Stampede. Points are based upon product purchase price. Bonus points can be earned by attending a Big Book of AV Tour event. Dealers can earn 2,500 points for each sponsoring vendor’s booth they visit during a Big Book of AV Tour event. If they visit all 10, then they would earn 25,000 points. In addition they can earn 1,000 points for each training session presented by a sponsoring vendor during a Big Book of AV Tour event. Dealers can earn an additional 1,000 points for each manufacturer training session attended during a Big Book of AV Tour event. Periodically Stampede will offer Double Points promotions. During these, limited time promotions double points will be awarded for purchases of qualifying products during the promotional time period. There will be three grand prize winners from the United States. Grand prizes include an all-expense paid trip to the 2018 Super Bowl for the reseller and a guest from February 2 to February 5, 2018. Each all-expense paid trip includes round trip airfare, three nights of hotel accommodations, meals, and two tickets for the Super Bowl on February 4. Complete details on qualifying products, as well as terms and conditions are available from any Stampede Account Manager at the Victory Formation website.